During 2015, students from schools in around 35 countries have collaborated to create and perform Global SkyLight Opera together, providing a platform for both creative science learning as well as cross-border friendship and cooperation. 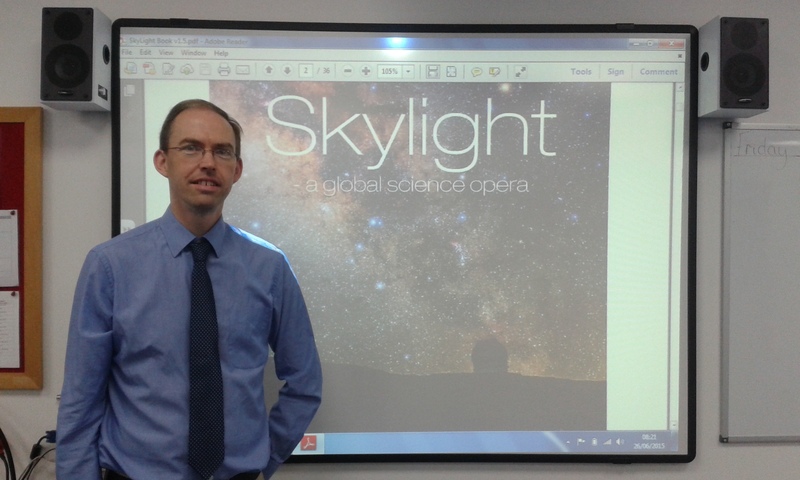 Global SkyLight Opera has been endorsed by the International Astronomical Union as an official project of the International Year of Light and Light-based Technologies 2015. The Premier Academy in Bletchley, Milton Keynes is representing the UK in the global SkyLight Opera project, with the performance as part of World Space Week on 3rd October. Their Head of Music, Jonathan Harris, has composed music to four scenes from SkyLight Opera which are being performed by countries including Brazil, Iran and Italy as well as the UK. All of the current year 6 children at The Premier Academy have been learning three scenes, parts of which include movement, speaking, instrumental playing and percussion work as well as singing. They have already performed these in their school assembly. In addition, The Premier Academy is working collaboratively with The Open University on the project. 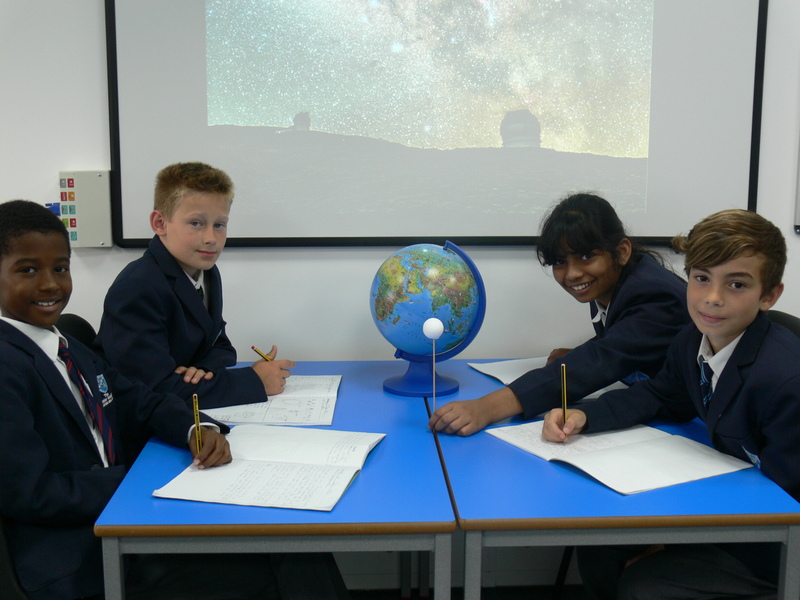 Dr Lucia Marchetti from the Department of Physical Sciences has visited the school to give lessons on space, light and the moon. UK students participating on the SkyLight Opera Project. Credit: SkyLight Opera Project. The school is also establishing links with other countries involved with SkyLight Opera; in particular, they are sharing their work with Andross Primary School in Australia, whose children are the same age. Awareness of all the countries involved in SkyLight Opera has helped broaden the children’s horizons. We have sent recordings of their singing to the different participating countries; there is a real ‘wow’ factor in knowing that their music making has been heard all around the world. The children are fascinated by the Lunar Mission One project. The thought that recordings of their music will be sent to the moon has created now only created genuine excitement but also a fascination with the moon and planets, space travel and our place in the universe. During a recent full moon, one year 6 girl insisted her parents stop the car so she could get out to take photographs; the mother said ‘she’s not been interested in anything like this until SkyLight Opera appeared’. The Year 6 children will be filming their scenes during September, then performing them live alongside the other participating countries, streamed across the internet, on 3rd October to open World Space Week. The whole project will be put together into a film, to be shown across the world. Following this, The Premier Academy will involve younger children in SkyLight Opera and the links to learning about space. During 2015/16, the Year 5 children will be learning about space, with links to the Lunar Mission One project and SkyLight Opera. Global SkyLight Opera has now reached over 35 countries from all around the world. Children have engaged on many levels including songs, dance, drama, composing and general music making. The power of the SkyLight Opera project to break down barriers through this shared international project has been immense, with connections and friendships being formed around the world. It has also inspired many children to increase their knowledge of science, in particular light and space. The potential for the future of SkyLight Opera is huge and very powerful on many fronts. It links science and the arts in a beautiful, creative way and forms harmony and cooperation within the participating groups and between different countries and cultures. Watch this artistic space and you never know where it will take you. Jonathan Harris is the Head of Academy Music at The Premier Academy, Milton Keynes UK. He is also an experienced church organist and choral director.